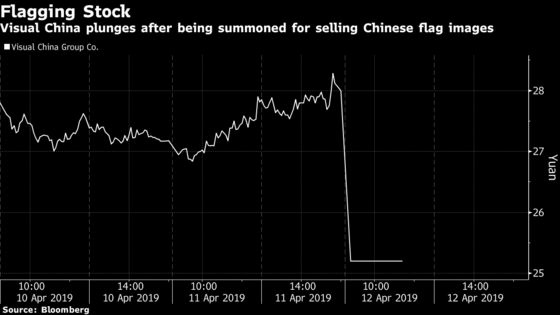 Visual China Group Co. plunged by the 10 percent daily limit Friday after regulators summoned the firm for selling images of the national flag and emblem. The company apologized on Thursday for claiming copyright of the pictures and charging for their use, and has since removed the offending photos from its website, it said on its microblog. The apology came after the Communist Youth League of China questioned the sales of the images on Weibo, according to a Global Times report. The league had been searching for images of the first-ever photo of a black hole, which they allegedly also found on sale on the company’s website, the report said. The National Copyright Administration issued a statement responding to the incident on Friday, warning firms against abusing their rights. The bureau will step up copyright regulation in the photo sale market, it added. People’s Daily commented in a Weibo post late Thursday that preventing copyright protection from "sinking into a black hole" was just as important as advocating to pay for copyrights. The post came with a picture featuring just four Chinese characters, translating to "I dare not attach any photo." Distribution of copyrighted content is a key part of Visual China’s business and it holds one of the industry’s largest market shares in the country, according to a China International Capital Corp. note dated April 3. The brokerage issued a new buy rating on the stock, citing its growth outlook in the area.